Nikon proudly introduces a universal confocal microscope system that is ultra-compact and lightweight, yet provides confocal images of the highest quality in its class. With the C1, confocal microscopy is now a mainstream technique affordable by all. A successful fusion of Nikon's optical and electronics technologies, the C1's resolution, contrast, and fluorescent image brightness are all top-class and "State of the Art." Image sizes of up to 2K by 2K at 12 bit image depth can be easily scanned. Changing the filter to match the fluorescent dyes you want to use is simple and quick, enabling the use of the latest probes or dyes available today. 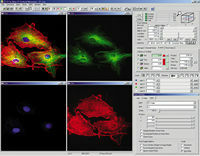 The C1 supports almost any imaging technique required today, including simultaneous 3-channel fluorescence, 3-channel plus DIC, time-lapse recording, and spatial analysis. All main components are modular including the laser box, scanner head, and detector module, saving desk space and allowing easy upgrades and maintenance. The C1's Graphical User Interface (GUI) is extremely simple and intuitive. From the time of initial use, you may never need to refer to the manual for typical operation. Each of the modules is pre-calibrated, eliminating the need for calibration during setup. Just connect the modules you need, and you are ready for optimal image capture. With a small footprint, the C1 does not get in the way of other lab equipment. Consequently, there is plenty of work space left around the microscope. Why are the C1's images so good? Stray light, which is usually generated in the scanner head and common in some other designs, is thoroughly eliminated, while reflection loss on the I/O ends of the optical fiber is minimized. This makes it possible to obtain images with extremely high contrast and photon efficiency. * Fluorescence transmission efficiency has been dramatically improved to obtain fluorescent images 3 times brighter than previous Nikon models. This, coupled with the use of high quantum-efficiency photomultiplier tubes, gives clear, sharp images even with fluorescent specimens that in the past were too dim to observe. * Signal-to-noise ratio has been increased 7-fold (compared to previous Nikon models), resulting in a significantly improved image quality. * 12-bit digitization pixel depth ensures the quality, dynamic range and sensitivity that is required of a 4-megapixel image . The scanner head can be easily mounted on either upright or inverted microscopes to support a wide range of applications. The wider range of excitation light wavelengths facilitating the use of an increased number of fluorochromes in research has increased the demand for the number of lasers available on the market. The C1 comes with a series of lasers supporting almost every fluorescent dye used in research today. Besides the excitation lasers, a full selection of emission filters are available to support a wide range of fluorescence observation needs. The detection module is supplied with appropriate dichroic mirrors, allowing simultaneous 3-color observation of fluorescence images of specimens prepared for 3-color imaging . All settings and procedures required for live image capture-fundamentals in confocal microscopy-can be viewed in a single window, eliminating the need for the operator to switch between many windows. The operation panel gives you an at-a-glance picture of all important settings including scan mode, scan speed, pixel size, zoom/pan, PMT settings, pinhole, shutter, and color image look-up table. With the C1, scanning modes are expanded from 2D (XY, YZ, XZ), to 3D (XYZ, Xyt), and even further to 4-dimensional (XYZt) scans. All required procedures for time-lapse recording, including the setting of inter-cycle times, frame intervals, and the number of images to be captured can be provided in a single window for quick, easy operation. 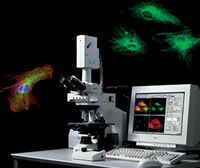 Image capture via sync-control from automated accessories or connected electrophysiology equipment is also possible.